July 3, 1979: The first organizational meeting of Mrs. Karen Marshall, Mrs. Evelyn Burton, Mrs. Donna Brumm, Mrs. Sandra Smith, the Reverend Michael Trinklein, Pastor of Immanuel Lutheran Church of Boonville, and Mr. Dan Magnus, Director of Christian Education at Immanuel was held in the office of Reverend Trinklein. July 14, 1979: An ad was placed in the Fayette Democrat Leader for persons interested in attending Lutheran Church services to contact one of the four families working to organize a church. August 16, 1979: A second meeting of the Howard County ladies was held with Reverend Trinklein. August 20, 1979: Article in Fayette Newspaper: Lutherans explain quest for Church. Why another Lutheran Church? Simply because there isn’t one in the Fayette/Howard County area. 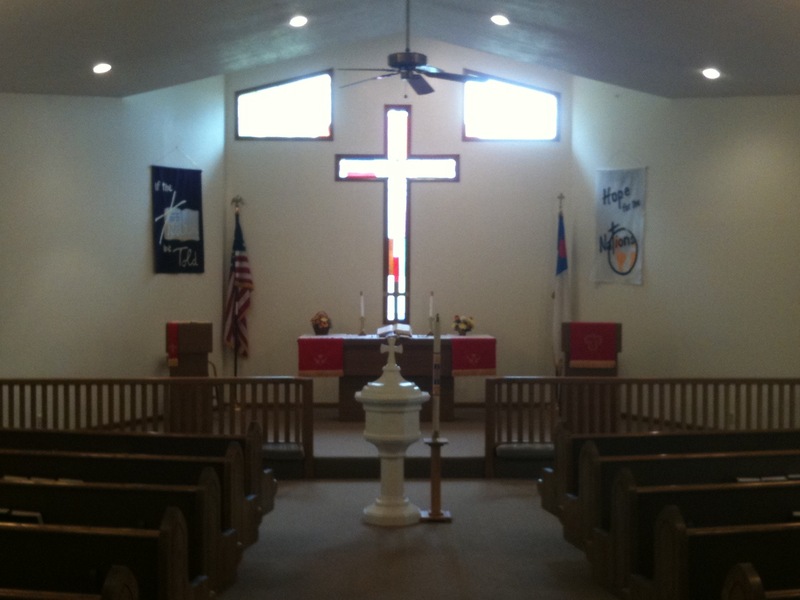 A strong part of the reason for the rapid growth and development of the Lutheran Church in previous years was its desire to provide pastoral care and the ongoing worship of Word and Sacrament to its members living in areas where we have no church, but who expressed an interest in receiving the same. The proposed establishment of a Lutheran Church in the Fayette area should not provoke any accusations of divisiveness, nor any expressions of false pride in comparing one church body to another. This is simply an effort to fill a need felt by those Lutheran Christians who have been brought up in the traditions, practices, and distinctive teaching of their church. The Lutheran Church wants and needs to be faithful to what it considers to be a “commission for mission” from the Lord of the Church, as recorded in Matthew 28:19-20. Go ye therefore, and teach all nations baptizing them in the name of the Father, and of the Son and of the Holy Ghost: Teaching them to observe all things whatsoever I have commanded you: and lo, I am with you always, even unto the end of the world. Amen. September 7, 1979: A third organizational meeting of the Howard County Ladies was held with Reverend Trinklein. September 16, 1979: The opening service of welcome, praise and reception, of the Fayette Lutheran Mission, was held in the multi-purpose room of the Fayette Middle School. The Reverend Michael Trinklein officiated. Sixty-six persons attended and offerings of $1088.67 were received. Greeters and registering guests: Dawn Brumm and Georgia Marshall; Acolyte: Don Brumm, Jr.; Ushers: Kevin Smith, Greg Smith, Greg Marshall, and Keith Ruether; Pianist: Mary Jane Wright; Serving refreshments: Mrs. Juanita Shaw, Mrs. Lou Shirley, and Miss Shannon Burton; Accounting of Offerings: Mrs. Joyce Gibson and Mrs. Sandra Smith. Officers were also elected: Interim Chairman: Mr. Don Brumm, Sr.; Secretary: Mrs. Evelyn Burton; Treasurer: Mrs. Sandra Smith. Hosts for the event were: Don and Donna Brumm, William and Evelyn Burton, Dr. William G. and Karen Marshall, and John and Sandra Smith. September 23, 1979: The First Christian Church, Disciples of Christ, church membership of Fayette, generously agreed to rent the Multi-Purpose Building to our congregation. On special occasions, the main facility was used. The first worship service was held in the building on September 23, 1979. Worship services were held there until January 1990. October 1979-June 1980: Of the 36 worship services held, Reverend Trinklein conducted 27. The remaining services were led by these area Lutheran Pastors: Reverend Mark Smith, Salem, Forest Green: Reverend James Troyke, Zion, Lone Elm; reverend Herbert Swanson, Calvary, Columbia; and by D.C.E. Dan Magnus, Immanuel Boonville. Reverend Trinklein also helped our congregation organize, instructed the confirmation class, provided pastoral care to the congregation, installed Vicar Fred Hazel, III, and was supervising Pastor to the Vicar during his assignment in Fayette. Our First of many bake sales was held on October 27, 1979 at the Fayette Shoe Store. Much was accomplished in 1980-1981. Among them, the church constitution was written and approved by the congregation and Church officials of the Missouri District of the Lutheran Church, Missouri Synod. An information class was started. Our first Confirmation was held in 1980. those confirmed were Dr. William G Marshall, Jennifer Sanders, Shannon Burton, Kevin Smith, Greg Smith, Keith Ruether, and Don Brumm. Pastor Trinklein officiated. Charter Sunday: Charter Sunday was held on June 7, 1981. There were four youth confirmed, three youth and one adult baptized, six adults confirmed, and three adults were received by affirmation of faith. Fifty-five persons signed the Charter. A daughter was born on August 21, 1981 to Vicar Fred Hazel and his wife Marilyn. Members voted to name the Lutheran Mission, Shepherd of the Hills Lutheran Church. November 1981-April 1983: A graduate of Concordia Seminary, St. Louis, Reverend Fred Langlois was assigned to server the congregation. He resignd as Pastor and from the Lutheran Church, Missouri Synod in April 1983. We bought our Church lot, consisting of 8 acres from Keith (Kay) Anderson in November 1982. August 1984-November 1986: Reverend Loren Famuliner served his year of Vicarage in Fayette, then was ordained into the ministry in August of 1985, and served this congregation until November 1986 when he accepted a dual parish at Corder and Waverly. April 1983-November 1986: the congregation was faithfully served during this period by: Reverend Gilbert Wenger, Pastor Emeritus, of Boonville, Reverend Norman Bultman; Pastor Emeritus of Jefferson City; Reverend Henry Kleindiest, Hospital Ministry after retiring from Triniy, Columbia; Reverend Oscar Helwegge, Pastor Emeritus, Marshall; and Reverend James Troke, Bunceton. Reverend Edgar Priess, Pastor of Trinity, Clark’s Fork served as vacancy Pastor from April 1983-August 1984, and also as supervising Pastor to Vicar Loren Famuliner until he was ordained in August 1985. We will be eternally thankful that the Lord blessed this congregation with faithful servants dedicated to serving Him and ministering in Fayette. These Pastors served congregations faithfully until retirement, and then they faithfully served this congregation. We were truly blessed. February 1989-March 1990: Vicar Daniel Garber served his year of Vicarage in Fayette. Supervising Pastor was Reverend Douglas Morton, Immanuel Lutheran Church, Boonville. Pastor Morton was also Vacancy Pastor from August 1988 to March 1990. March 1990-June 2000: Reverend Allen Mack served this congregation in a dual ministry as a Prison Chaplain in Jefferson City. The groundbreaking for the new church was held on June 23, 1991. the new church building was dedicated in October of 1992 with many members and guests present. Pastor Mack assisted in the loan process for the new facility, and also spent many hours in the building project. On June 18, 2000, Reverend Allen Mack was called to his heavenly home. Pastor Mack did much for our congregation and community. He is greatly missed by both church and community. September 2000-Present: Reverend Andrew Etzler was installed as our ministor on October 14, 2001, after having served for a year as vacancy pastor. He is a worker/Priest, working as a network engineer at Central Technology Services in Jefferson City as well as serving our congregation part time. Pastor Etzler and his family Carolyn, Joshua, Rachel, Zachary, and Rebecca are a wonderful addition to our church family.